Every now and then I talk to a mom who has had to give up just about everything, food-wise. Wheat, dairy, eggs, soy, nuts, maybe even meat. Just thinking about this terrible fate can make you hungry. What do you eat? What can you eat? All roads lead to a plant based diet in this situation but fear not! There are ways to survive without feeling deprived. You are not limited to merely leafy greens. Grains like lentils and quinoa will add bulk to a dish. Starches like potatoes, sweet potatoes and winter squash are great to cook with as well. Popcorn and kale chips make excellent snacks. Here is a quinoa (pronounced kee-wah) salad that is hearty and delicious. Best of all it can be made in stages. You can fix the quinoa and roast the butternut squash a few hours ahead of time. Preheat oven to 400. Heat 1 tbsp olive oil in a large saucepan over medium heat. Add the quinoa and toast for about 2minutes. Add water, salt and pepper and bring to a boil. Cover and simmer 16 minutes. Remove from the heat and let stand for 10 minutes. Fluff the quinoa, spread it out on a baking sheet and refrigerate until it is chilled, about 20 minutes. Toss squash in 1 tbsp olive oil. Season with salt and pepper. Spread the squash out on a baking sheet and roast for about 25minutes tossing once during baking. Squash should be tender when done. Remove and let cool. In a small bowl combine 4 tbsp olive oil with lemon juice. Put garlic through a garlic press and whisk into liquid with salt & pepper. Cover and set aside. 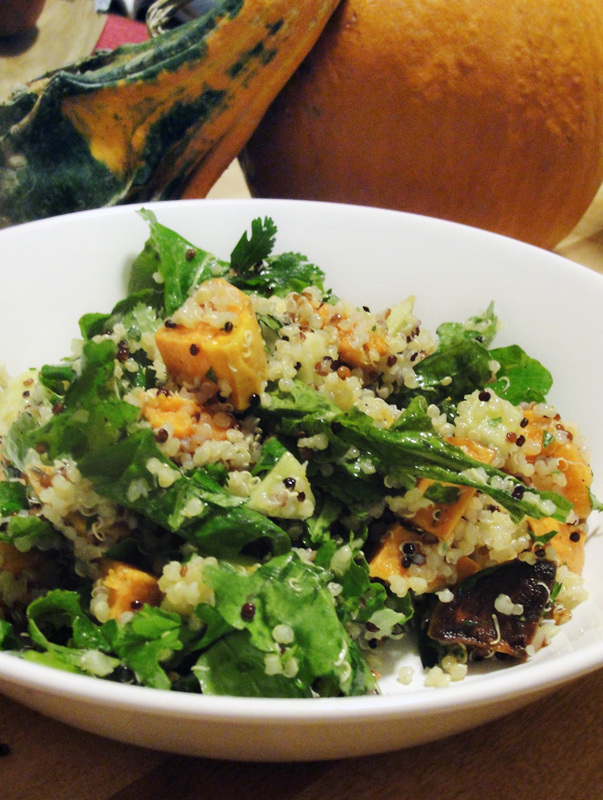 Combine cooled quinoa, squash, onion, apple, fresh greens and toss with olive-lemon juice dressing. Add cilantro and a dash of balsamic. Serves 4. This recipe was inspired by one I saw in November’s Food & Wine magazine but I took many liberties with it including changing the dressing completely. This entry was posted in Dinner, Lunch and tagged apple, butternut, quinoa, salad, squash on October 31, 2012 by nursingmomscook. As long as we’re on the subject of sandwiches, let’s talk ham & cheese. A croque-monsieur is a grilled ham and cheese sandwich enjoyed in many a French café. Croque comes from the French verb “to crunch” and rymes with “lunch”. When I was ready for lunch today I was ready to cruch a croque with gusto. There is everything to love about grilled ham and cheese and even more to love when you add a few flourishes, American style. Today I added some tomatoes from the last gasp of my garden. They’ve been hanging in my kitchen while I will them from green to red. I snipped a few basil leaves from the plant on my sunporch that I swear I’m going to harvest into pesto just as soon as I have the time and I remember to buy pine nuts. This satisfying sandwich would probably be even better with an artisinal bread, like a good sourdough or French loaf, but all I had was regular whole wheat sandwich bread which still tasted great. The croque-monsieur is typically made with Gruyere cheese but you can use almost any other cheese; cheddar, Swiss, Havarti, or Munster will also work. Heat a griddle or pan to medium low heat. 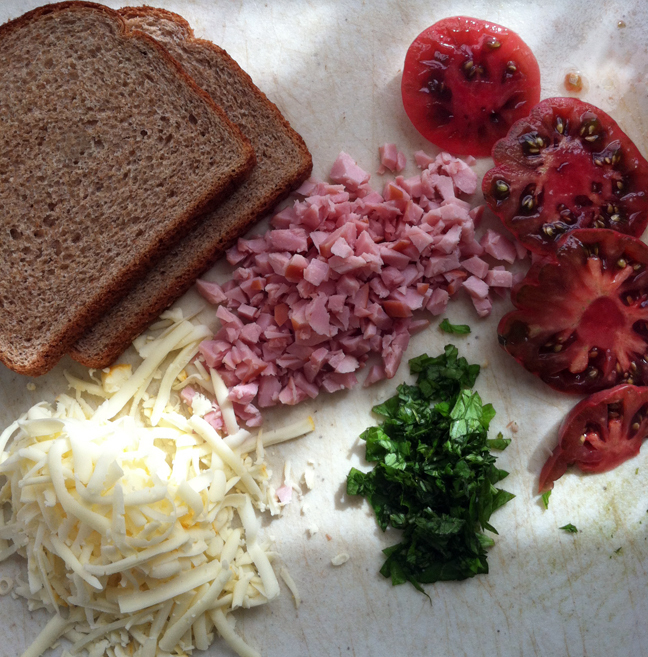 Assemble the sandwich in layers-bread, cheese basil, tomato, ham, basil, cheese, bread. Put a pat of Butter in the pan just big enough to cover the size of the bread. 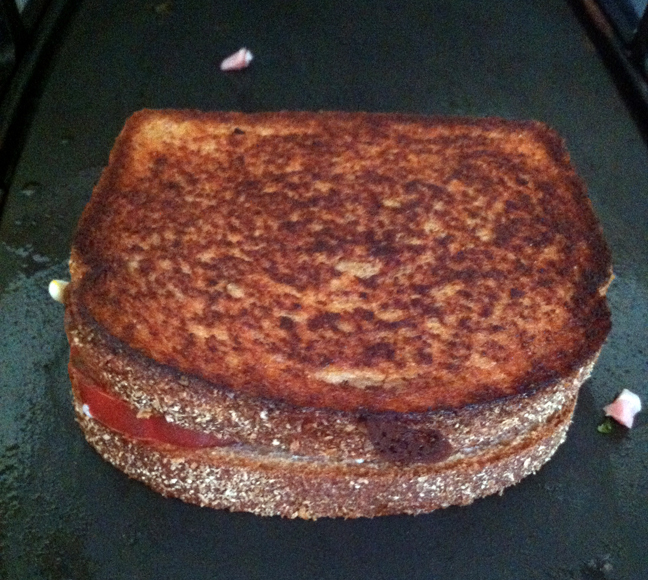 Grill for about 2-3 minutes on each side or until the bread is the desired color. You may want to put a small lid on the top piece of bread while it is grilling to help the layers forge. 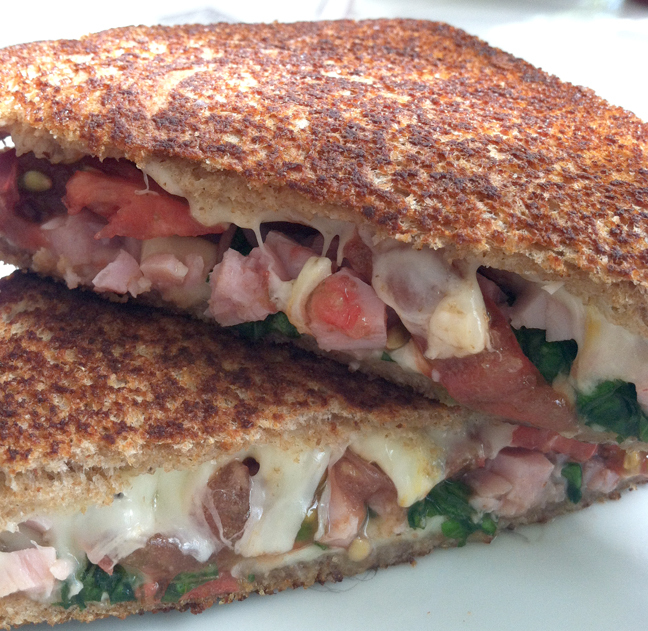 This entry was posted in Lunch, Snacks and tagged basil, cheese, croque, crunch, easy, ham, sandwich, tomato on October 20, 2012 by nursingmomscook. When I had to give up dairy, I turned to a cookbook called Vegan with a Vengeance by Isa Chandra Moskowitz. It became my savior through that period and I have always trusted her recipes. 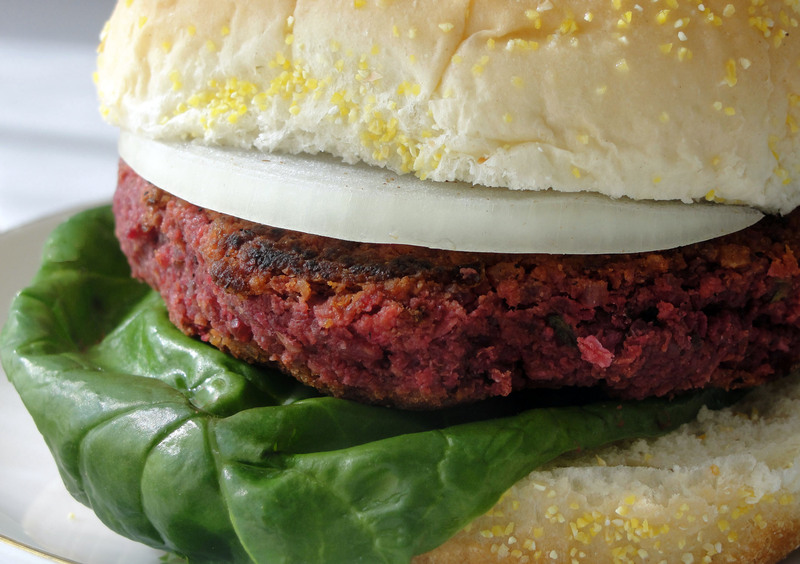 I tried the recipe for Beet Burgers from her website and it is phenomenal! They are hearty, tasty and thoroughly satisfying. They did not fall apart or stick to the plan as I expected them to, as my past experience with veggie burgers has usually been. When put together like a regular burger with lettuce, tomatoes and a bun you get the whole burger experience without the fat or that bloated feeling in the pit of your stomach after you eat. 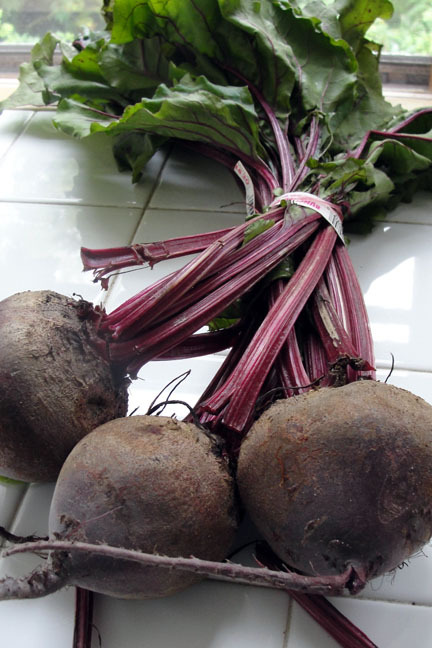 Beets are high in iron, B-complex vitamins and folic acid as well as being linked to numerous other health benefits. I used pre-cooked rice that I bought in a bag and a can of lentils, which saves so much time not only in the cooking but in the cleanup too. 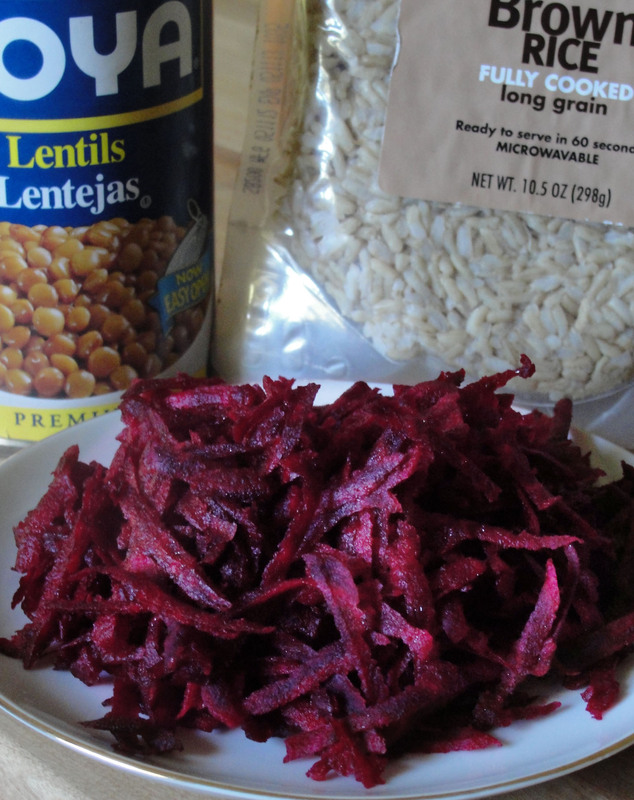 I shredded the raw beets in a food processor then added the rice and lentils. Easy. Pay careful attention to the cooking directions, I used a very hot cast iron pan and the cooking was flawless, which is very unusual in my kitchen. Now, my husband has high cholesterol therefore we eat very little red meat. I count myself extremely fortunate that he is an adventurous eater who is not picky at all with vegetables. But even if you do have a picky eater (or skeptical one) at the table they will have little to complain about once they taste these. They even look like meat. Notes on a slight variation-I did not have any fennel in the house and I’m not a huge of the stuff anyway so I left it out. The burgers appeared to suffer no loss. Now transfer to a mixing bowl and add all the remaining ingredients. Use your hands to mix very well. Everything should be well incorporated, so get in there and take your time, it could take a minute or two. Place the mixture in the fridge for a half hour to chill. Preheat a cast iron pan over medium-high. Now form the patties. Each patty will be a heaping 1/2 cup of mixture. To get perfectly shaped patties, use a 3 1/2 inch cookie cutter or ring mold. Otherwise, just shape them into burgers with your hands. Pour a very thin layer of oil into the pan and cook patties for about 12 minutes, flipping occasionally. Do two at a time if you’re pan isn’t big enough. Drizzle in a little more oil or use a bottle of organic cooking spray as needed. Burgers should be charred at the edges and heated through. Serve immediately. But they taste pretty great heated up as well, so if you want to cook them in advance, refrigerate, then gently heat in the pan later on, then that is cool, too. This entry was posted in Dinner, Lunch and tagged beets, burgers, vegetarian on October 17, 2012 by nursingmomscook.